Golf has reached a point where its participants do not need convincing that better fitness and health improves the swing. Today’s professional, amateur and recreational golfers need to trust their instructors, fitness trainers, therapists and doctors to know what needs to be done. A Titleist Performance Institute certification gives golfers that trust. 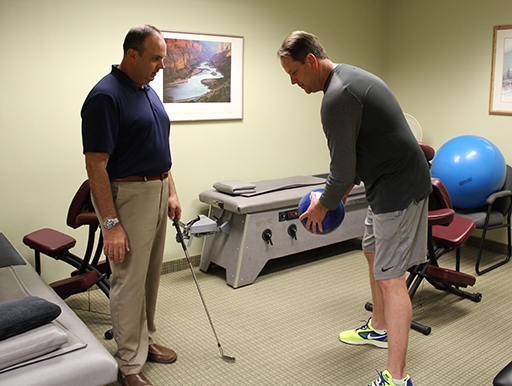 Dr. Stinner is now certified with the Titleist Performance Institute (TPI) and is performing in office golf fitness evaluations and on the range biomechanical swing analysis. The TPI program is the most comprehensive and easy to follow plan to identify the stability and mobility needs of each golfer. It presents an easy to follow golf specific exercise program and gives each golfer a golf fitness handicap index. All of this makes you able to enjoy the game, with less injury and better scores. Visit the Titleist Performance Institute on the web at mytpi.com Call our office today for more details and to schedule your golf fitness evaluation.